The Tulalip Tribes are collaborating with the state of Washington to fix some of the fish-blocking culverts that were the subject of a U.S. Supreme Court case last year. The Supreme Court affirmed in June that state blockages of salmon habitat violate tribal treaty rights. These rights require that fish be available for harvest. The decision upheld a lower court ruling that ordered the state Department of Transportation to restore fish access to about 450 of its 800 most significant barrier culverts in western Washington. So far, nine out of 138 barriers have been fixed in Snohomish County, according to The Daily Herald. For the past six years, Tulalip’s Natural Resources Department has been working with the state on all phases of barrier removal and habitat restoration in the tribes’ area of interest in the Snohomish and Stillaguamish watersheds. “The court case has been decided and now it’s time for all of us to work together to help recover salmon habitat,” said Tulalip Chairwoman Marie Zackuse. In November and December, more than a hundred coho salmon returned to a stretch of Edgecomb Creek that was restored in 2017. The creek, which provides spawning grounds for both coho and chum salmon in the Quil Ceda basin, was rerouted to the south side of Highway 531, a well-trafficked route through Smokey Point. Two inadequate culverts were replaced with a concrete box culvert, and the stream was relocated. “Some coho returned that year, but any time you move a stream, it’s inherently unstable,” said Derek Marks, Tulalip’s Timber, Fish & Wildlife Manager. Natural resources staff assisted in the stabilization of the new creek bed by adapting the riparian plantings. One of the keys to successful restoration is post-construction monitoring. “It’s important to pay attention to what happens after the excavators leave,” Marks said. 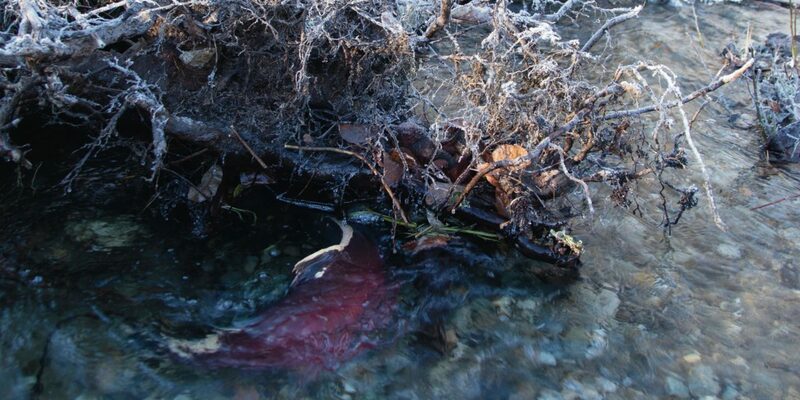 The new meandering creek saw so much spawning activity in 2018 that salmon eggs could be seen on top of the gravel, meaning the coho were creating redds (egg nests) on top of redds.